I was sent a copy of this book from the publisher. Over the centuries, immigrants have enriched our (American) culture and Allan Pinkerton was no exception. Arriving in the US from Scotland in 1847, Pinkerton was a natural at police and detective work. This dynamic biography of American’s first private eye is a captivating read. Pinkerton had a strong work ethic, commanding presence, distaste for corruption that would make this “hard-nosed boss” the most famous detective, especially during the Lincoln administration (1861-1865). In 1849 Pinkerton opened his National Detective Agency and quickly found work on the expanding railroad. Full-page and half-page archival photos & engravings accompany the story that highlights some of Pinkerton’s adventures. 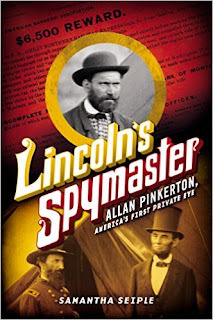 Pinkerton pioneered the technique of going undercover—using a disguise and acting a part—so he could secretly infiltrate situations to gain access to the suspect of the crime without raising suspicion. 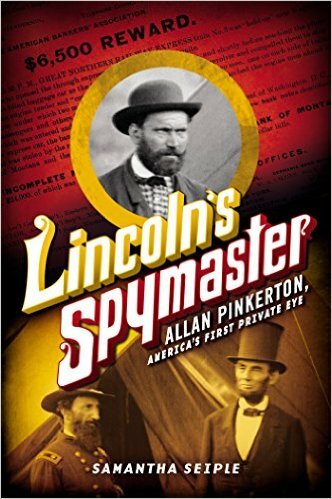 This technique, still used to this day, helped Pinkerton infiltrate the secessionists and successfully thwart their plan to assassinate Lincoln on his way to his inauguration which was to take place on March 4, 1861 in Washington, D.C. With the start of the Civil War on April 12, 1861, six days after Lincoln took office, Pinkerton and his secret agents worked hand in hand with the commander-in-chief of the Union army throughout the war. After the Civil War and as the West was being settled there were many gangs found robbing trains and banks which was an extremely profitable business. The Pinkerton National Detective Agency was kept busy hunting down The Frank Reno Gang, Jessie James, and the Cole-Younger Gang, to name a few. Pinkerton would run the agency, even after a massive stroke that left him unable to work in the field, until his death in 1884. His two sons, Billy and Bob took over the agency which, by 1890’s, began shifting their work to crime prevention. It wasn’t long before the name “Pinkerton” also became synonymous with “armed guard”. Pinkerton's influence can be seen to this day in how crimes are solved. His hard-boiled character was the inspiration for many detective stories: Sam Spade (The Maltese Falcon), Philip Marlow (The Big Sleep), Lord Peter Wimsey (Dorothy L. Sayers), Inspector Morse (Colin Dexter novels) and Inspector Lynley created by Elizabeth George, to name a few. And to think it began with America's willingness to embrace an immigrant from Scotland. Hand this to fans of Steve Sheinkin. 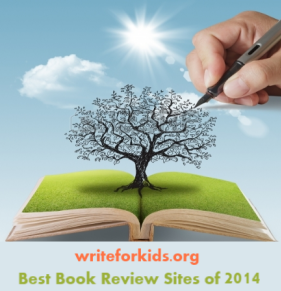 This book has all the things I like best in a book: biography, history, and mystery!